I really wanted to be impressed. Four different friends of mine who ALL have palates I respect strongly recommended this place. Guys, ya let me down. Except for the excellent value ( I will get 3 meals out of this $20 order) I was not happy with any of my choices. The chicken itself was dry and heavily over-seasoned. The skin was crunchy, but so greasy that I took it all off. The green sauce was fine, but not nearly as flavorful or spicy as my beloved Pio Pio’s (which I really feel this restaurant is just a blatant rip-off of). The tostones were the biggest disappointment. First of all, they didn’t come with a separate sauce like they do at Pio Pio. They were overcooked and hard as cardboard. They actually had a stale consistency which made me wonder if they were cooked earlier and reheated. My jaw was literally tired after eating a few of them. The plantains inside of way too much batter were cut too thin, so they completely lost their texture. They had SO SO SO much salt on them that I could actually brush some of it off each one- but it had already sunken in so far that I eventually gave up and threw them away. The salad was not really even worth commenting on. Walk a few blocks north and go to Pio Pio instead. The bummer is, despite my strong preference for Pio Pio, I am out of their delivery zone. I may be tempted to order from here again purely because they will deliver to me…but more likely I’ll order in from Eastside poultry instead. >I'm totally shocked.. If I ever order chicken this is the place I like. 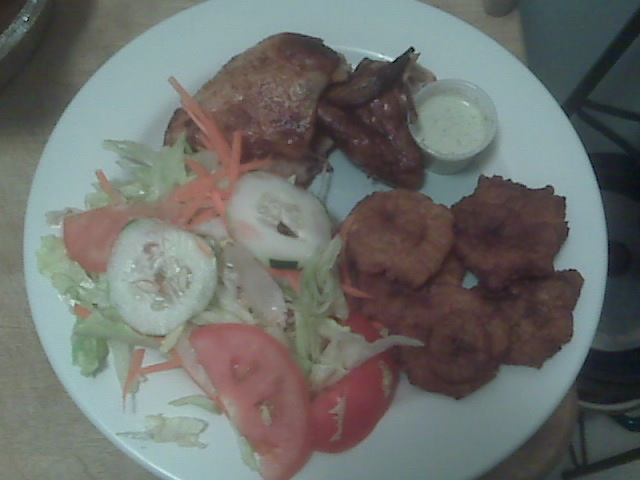 And I've never gotten dry chicken or hard tostones, or even battered plantains and in general I think this is much better than PIO PIO. >I am shocked too! SO many people that I trust told me how awesome this place is….I'll consider giving it another try, but I am doubtful. Maybe they were just having an off night…but It was really quite bad. >i love these commentaries and i wish u lived in la and did em here! >Try again. I have only had FANTASTIC food from Chicken Festival. Never dry, always tasty from start of the menu to end.